How to have a KILLER MBA Interview! Hey everyone, today’s post focuses on the interview process. As I get ready for interviews at Kellogg and Tuck (and TheEngineerMBA ramps up for his HBS interview), I am reviewing how I prepare for interviews. I have spent a considerably amount of time interviewing others and helping others prepare to interview. Here are a few secrets and techniques that have proven to be useful for myself, as well as countless others. What do you want the interviewer to walk away thinking? This powerful question is how I ALWAYS start prepping for my interview. Usually I want the interviewer to be confident in three elements of my profile: 1) Capable for the next transition (hopefully a star in the organization), 2) Able to bring a new element or aspect (hopefully a game-changer), 3) Is a good cultural fit for the organization. Once I figure out what I want the interviewer to think, I work my way back and think of examples or communication styles to assist getting to the finish line correctly. I am a huge fan of the STAR method when giving examples. (Check out this wikipedia link). People LOVE stories. It will help them remember aspects of your profile, and differentiate you from others. By describing a Situation, a Task, your Actions, and the Results, you are giving a TRULY unique aspect of your profile. Usually, I try to understand what aspects of my profile I really want to show off, and position my stories to share a common thread of my personality. Remember though: You are telling the story for a reason; make sure you don’t get lost in the details in the story. Make a clear connection between your story and your future plans with the organization/school. You should always have a good understanding of what questions will be asked. Clear Admit has a great resource for interview questions (Here is Tuck’s). From my experience, both going through the process and speaking with alumni, adcom, and admission consultants, I have found a few REALLY common questions. Why do you want an MBA (with this school)? What do you plan on bringing to the program in terms of career experience and club contribution (these are only two of many aspects)? What differentiates you from other candidates and makes your unique? What makes you unique compared to everyone else? How will you contribute to the discussion? How do you work in teams and what is your leadership experience? Make sure to talk about definitive leadership/teaming experiences, what you learned, and how you can contribute to the organization. 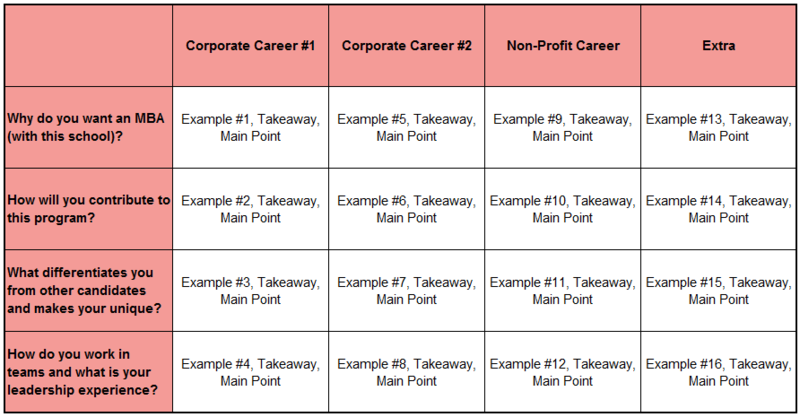 I utilize this grid for myself and anyone I help with interview prep. I ask them to collect 4-6 core questions and list them in the rows. Then I ask for 3-4 major roles they currently play in their professional career. We then populate the grid with appropriate examples. It is a great tool to refresh and understand what you bring to the table. I hope you find these tips and resources helpful! Please comment, ask questions, or give feedback!